A stream of solar wind hit Earth's magnetic field during the late hours of Aug. 15th, sparking beautifulgreen auroras around the barely-dark Arctic Circle. The gaseous material is flowing from a 700,000 km-long fissure in the sun's atmosphere. More auroras are possible on Aug. 16th as Earth moves deeper into the stream. A massive long coronal hole has opened up on our Sun and is shooting solar wind directly towards Earth at incredible speeds expected to reach 700 km/second. 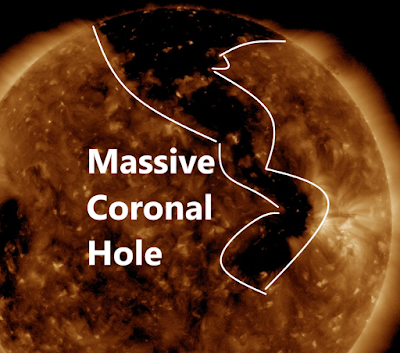 According to Spaceweather.com NASA's Solar Dynamics Observatory photographed the fissure on Aug. 13th pointing directly at Earth: This is a "coronal hole"--a region where the sun's magnetic field opens up and allows a gaseous material to escape. Solar wind emerging from the hole is expected to reach Earth on Aug. 16th and 17th. CIRs are transition zones between slow- and fast-moving solar wind. They often contain shock-like density gradients and strong magnetic fields that do a good job sparking auroras. SOLAR MINIMUM CONDITIONS ARE IN EFFECT: The sun has been without sunspots for 45 of the past 48 days. To find a similar stretch of blank suns, you have to go back to 2009 when the sun was experiencing the deepest solar minimum in a century. Some experts are linking this Solar Minimum to another mini ice age but after the summer we are having I wouldn't hold your breath.